I was hoping that today's update was going to finally involve some kind of promotional video for the Sengoku Basara: Judge End anime after the debut of the new Capcom TV series on Nico Nico Douga, however they stuck firmly to gaming coverage so it was a bit of a waste of time for people other than Ultra Street Fighter IV or Monster Hunter 4 fans. 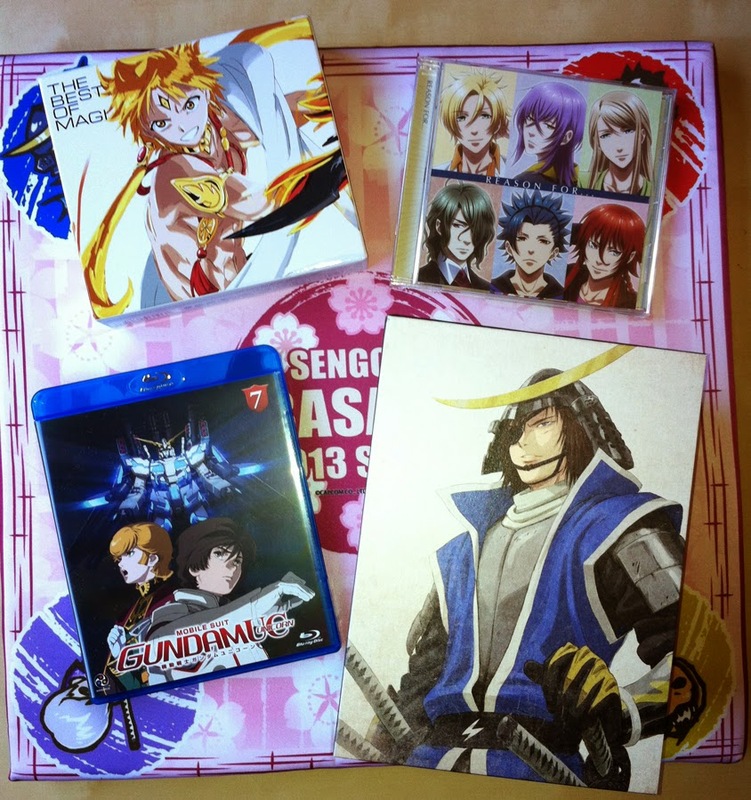 Fortunately something cool arrived so I can post about that instead: the Sengoku Basara Complete Box. It only went on sale today in Japan so I have to praise Amazon and DHL for their mind-blowing delivery speed! Also pictured is the final volume of Mobile Suit Gundam Unicorn on Blu-ray, which means I managed to get a complete set of matching English editions even though Beez stopped distributing them here. A tip for other UK fans who are having trouble sourcing their Gundam Unicorn: JP Books in London can supply the discs at half the ridiculous price that stores such as Amazon UK are asking. They will post to UK addresses so it's the cheapest way to get hold of the series unless you want to import the significantly nicer Japanese edition. Two new CDs complete the picture. REASON FOR... is the ending theme to the Kamigami No Asobi anime and The Best Of Magi is exactly what it sounds like. I wonder whether I'll ever get to see the end of Magi? I don't want to pay Aniplex USA's price for their DVD-only sets, and Animax's streaming service has too many delays to be worth paying for. Anyway, back to the gorgeous Sengoku Basara set for a few extra pictures to convince me that buying the anime again wasn't silly. Back when I placed the order I made up a flimsy excuse about it being a late birthday gift to myself. 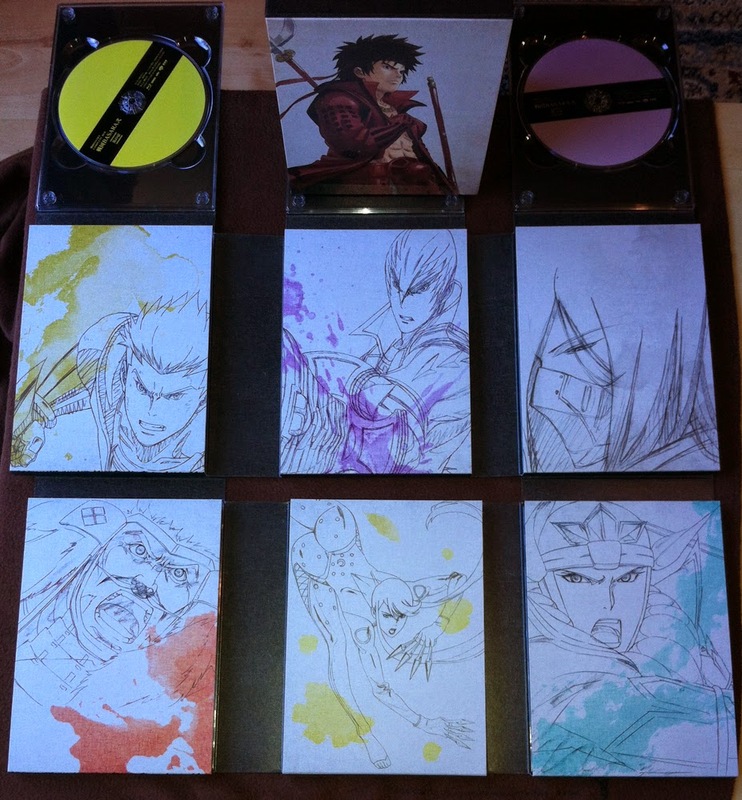 The matte chipboard box contains two thick fold-out digipaks covered in beautiful anime-style artwork. Each 'page' of the digipak holds one disc; there are seventeen in total. It feels luxurious. 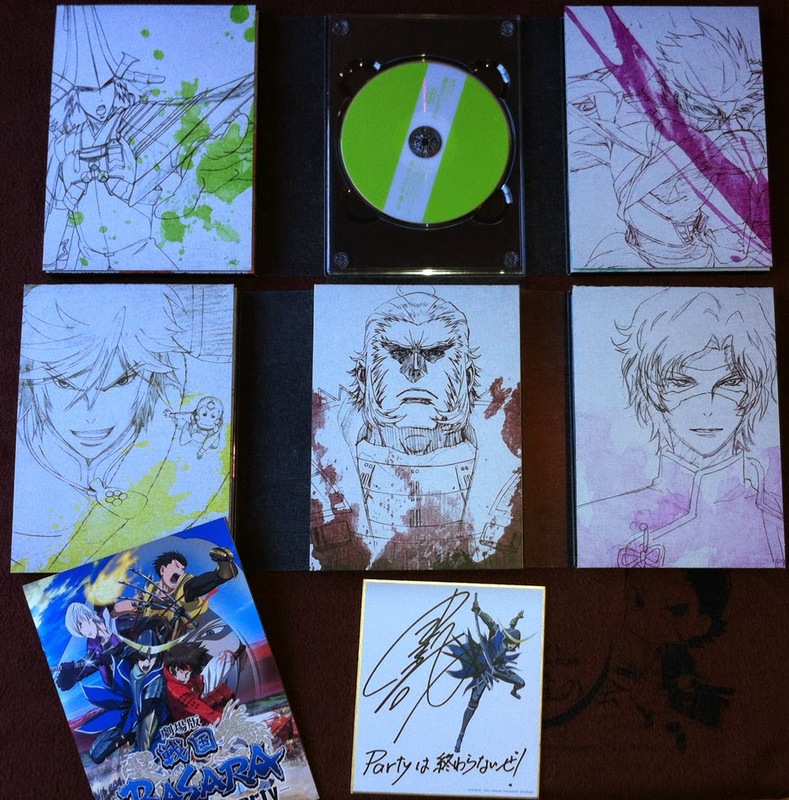 There was also a replica autograph board 'signed' by seiyuu Nakai Kazuya and a full-colour replica of the original theatrical pamphlet for Sengoku Basara -The Last Party-. Perhaps it's time for a rewatch of the previous anime to help pass the time until Sengoku Basara: Judge End? There are so many pieces of artwork now which are in need of a new artbook to contain them all. 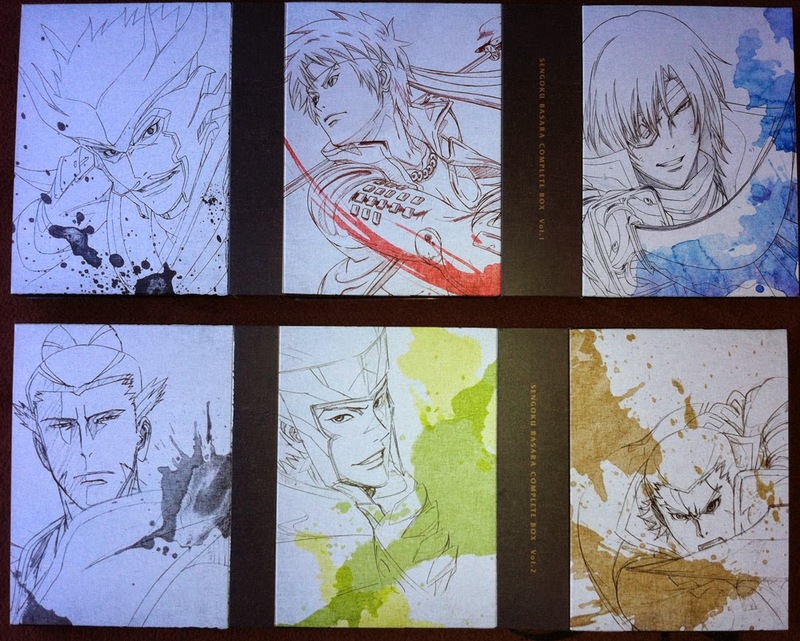 I really loved the Kasuga picture they used for the the Browser Sengoku Basara promotion a while back too (umm this one) and it would be nice to have them all together in one place.